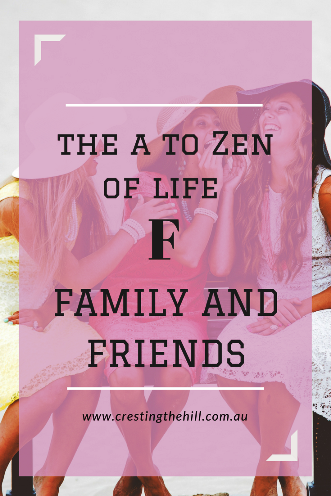 The sixth letter of my A to Zen of Life (via the Dalai Lama) is F for Family and Friends - "they are hidden treasures, seek them and enjoy their riches". The Dalai Lama hit the nail on the head with this one - relationships are what life is all about aren't they? Family is where we first learn to love and be loved by others. No family is perfect and we all have stories to tell from our childhoods where we felt we were hard done by or missed out on something we thought we were entitled to. But, we also know in our heart of hearts that we were loved and cared for and brought up to understand our role in society and how to get on in this world we were born into. Midlife has taught me so much about the value of family - not a day goes by without me appreciating how fortunate I am to still have my mother in my life, and also to have a wonderful husband, thriving adult children, and a beautiful granddaughter - what a great legacy to have in life! 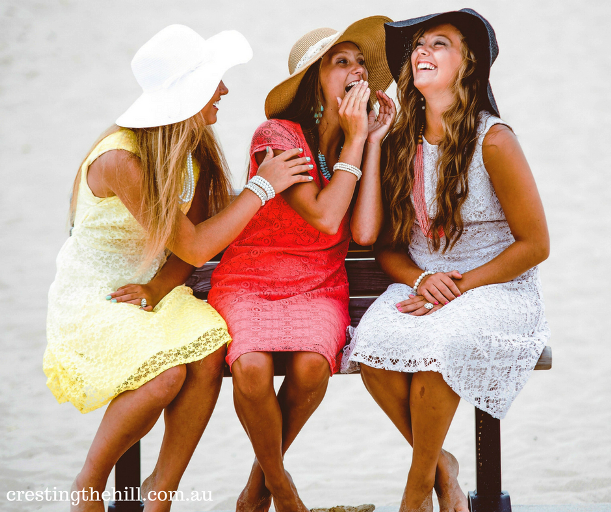 Along with family, being blessed with strong friendships is one of life's greatest joys. Old friends, new friends, childhood friends, family who are friends.....the list goes on. Every one of my friends is special in their own way and they make my heart smile when I'm with them. Having people who are in your life because they want to be - not because they have to be - is so wonderful isn't it? Friends may come and go in life - we don't get to hold onto all of them forever, but those who we share our hearts with are such a blessing. The support and encouragement they give us is priceless - truly something to be treasured. 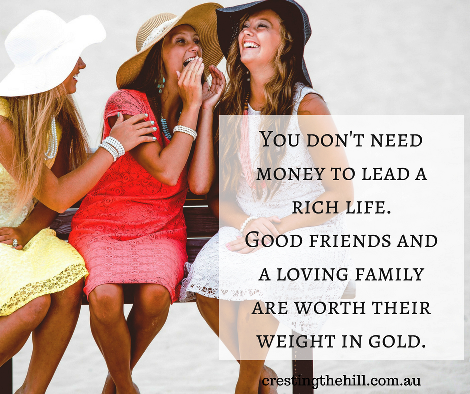 Are family and friends as important to you as they are to me? Do you consider yourself blessed because of the people in your life. Do you remember to tell them how special they are to you? Relationships are what life is really all about aren't they? 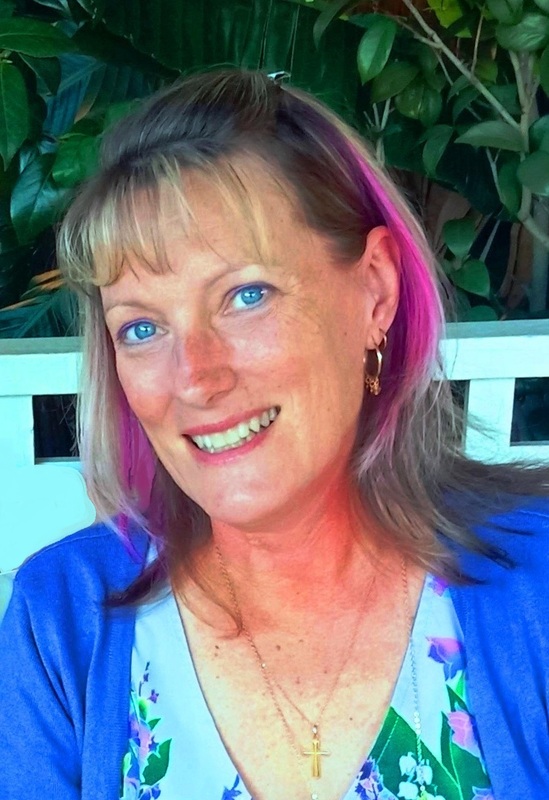 Hi, Leanne, I love that you (and others in your timezone) are almost a full day/letter ahead in the 'A to Z Challenge'. It definitely keeps it interesting. I agree that relationships are one of life's greatest joys. In fact, I believe that they are the meaning of life. Without them, where would we be? I love the picture.. i agree with you.. strong friendship is greatest gift of life.. I would be lost without my family. I am very close to my daughter and my sisters. My daughter will drive from WV to Oh to spend the weekend with me and so will my sisters. I know I can always count on them. I think this is my realisation too in my forties that friends and family are far more important that anything else in life. I have also started spending more time and love with them VS my other interests! I'm so fortunate that I still have both parents & my siblings. Sure I might complain about them from time to time, but boy am I grateful they're there - and for the upbringing I had. Then there are those friends who, in many ways, are closer than family - because they're the ones you've chosen to share parts of you that you don't share with family. I agree with you Leanne, it's all about family and friends. My family are very important to me and I've realised just how much this year! Hear hear, Leanne (and the Dalai Lama)! I miss my family and often wish they lived closer (but actually it's me who moved away). Thankful to have my boys nearby, at least for now!! Family is so important. Most of my family lives far away, so it is easy to let my relationships with them slide. I've been working on that a lot this year. A real bonus comes when family members are great friends, too. Two weeks before one of my brothers unexpectedly passed away, he told me, "Who would have thought that the oldest son [him] and the youngest daughter [me] would become such great friends." I cherish that. The lines have blurred over the years between family and friends. I'm so thankful to have family members that have become best friends and friends that have become family. F&F are definitely very important to me as well. I have a bit of a hard time about "Friends may come and go in life" because my expectation of friends is for them to stay. Recently someone I believed was a good friend, deleted me from Facebook, and when I asked him about it he said I didn't keep in touch. Which is true but come on, life is busy, even if I don't call, I care!? You've summed up my feeling exactly! I, too, am still enjoying my parents who are in their 80's, my grown children and my grands. Along with friends, they keep me sane, grounded, and feeling loved. So very true. There is nothing better than a casual day spent with dear friends and family. I could not agree more! Family (and friends) are everything. The older I've gotten, the more I appreciate the blessing of family and friends. They keep us on the right track and lift us up when we're down. And we can do the same for them. Have a great day! Family has always been super important to me. I have a mixed family with many step relatives, but we are all close and I would do anything for them. I value my friendships too, but it's been harder to keep in touch with people since having my daughter. Some of my friends are at completely different life stages now, so we don't always have a lot to talk about. But there are one or two that I am still close with even if I go long periods without seeing them. My friendships are vitally important to me. So is family when family behave similarly to good friends. Indeed we are blessed by friends and family. When I retired, I moved to be closer to family and friends. It was a great decision! In our new home, we are meeting lots of new friends. One of the benefits of retirement is having more time to invest in relationships. I love my Saturday Sisters, Leanne. I believe it isn't the quantity of friends but the quality if the friendship that is important. I do miss my Mum though and haven't had her for over 30 years but I am surrounded by a loving family and will soon have another grandbaby so life is good. I've got a two-fer: my daughters have become my friends!! It's a wonderful thing. Great post. A post which resonated with many Leanne. I never dreamt that by the time I was in my late 50s that all four of my brothers as well as my sister-in-laws, a nephew, and a whole lot of friends would be gone. I'm 60 now and am appreciating the heck out of those who are here with me. I am still making friends, my daughter is a friend, and I am loving life.